License Plate Readers: We installed several license plate readers to help improve safety and security in the neighborhood, particularly when it comes to stolen vehicles! Thank you to our previous City Council representative, Alex Wan, and the Atlanta Police Foundation for making this possible. 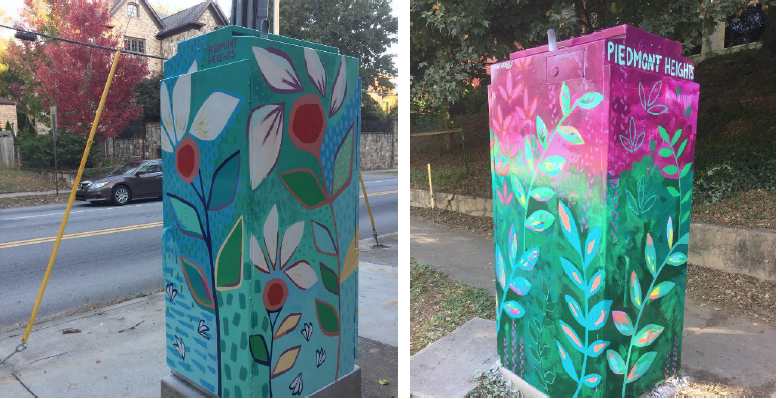 Give Art a Start—Traffic Signal Box Beautification: Thanks to a $2,400 grant from the Mayor's Office of Cultural Affairs, we were able to commission local artist Lauren Pallotta Stumberg to paint two traffic signal boxes. Not only is the artwork beautiful but the botanical themes help to celebrate our local park (Gotham Way Park) and our historic landmark, Monroe Nursery and Gardens. Check out the new boxes on Monroe Dr. and Montgomery Ferry Dr. as well as Monroe Dr. and Armour Dr. intersections. Piedmont Heights Walking Trail Map: Thanks to a $500 Neighborhood Planning Unit grant from the City of Atlanta, we were able to create a walking trail map (online and downloadable as a PDF). Now, neighbors can learn about Piedmont Heights' unique history and its landmarks—historical, environmental, quirky, and more! Gotham Way Park: We are so close to reaching a major fundraising goal in order to renovate the Gotham Way Park playground! Please help us reach this milestone—sponsor our upcoming Fandango or purchase a ticket for the event on Tuesday, November 27! Thank you to Eclipse di Luna for hosting us! Greater Piedmont Heights Business Alliance: Two wonderful events in 2018 brought local businesses and neighbors together to learn more about the evolution of the neighborhood as the Atlanta Beltline progresses through Piedmont Heights. Thank you to Mason Fine Art, Eclipse di Luna, and Mixx for hosting and feeding our groups this year! Annual Meeting: Our Annual Meeting was held at Ansley Golf Club, where our members voted on our 2019 Board Members. They also learned about neighborhood and larger Atlanta updates from our elected officials, City Council president, Felicia Moore; City Council Representative At Large, Matt Westmoreland; and Director of Constituent Services for Councilmember Ide's office, Kent Strickland. And a huge thank you to our speakers, artist Lauren Pallotta Stumberg (Think Greatly) and Dewayne Bontrager (Twiin Media LLC)!